Unique Diamond Titanium Engagement Ring : LOVE2HAVE in the UK! 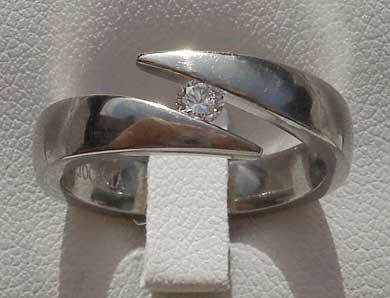 A unique diamond titanium engagement ring featuring a very different diagonal tension set diamond that is available in a polished or a satin finish. The approximate width of this fabulous engagement ring is 7mm wide at its widest point where the diamond is tension set. You have a choice of two sparkling white diamonds, the sizes being 5pt or 10pt. The diamond colour is H, and the clarity is SI, so, therefore, this is why they sparkle. The titanium band itself has a width of approximately 5mm where it tapers at the bottom. 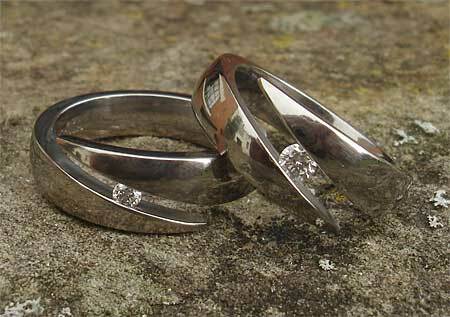 Titanium is a hard metal, and we use it for our stunning tension set titanium engagement rings. It would not be possible to recreate this design in silver or gold as these two metals are just not robust enough and the diamond would eventually fall out. Titanium is the only option for tension setting an engagement ring to make sure the stone stays in place. Even then you must use aircraft grade titanium and nothing else. 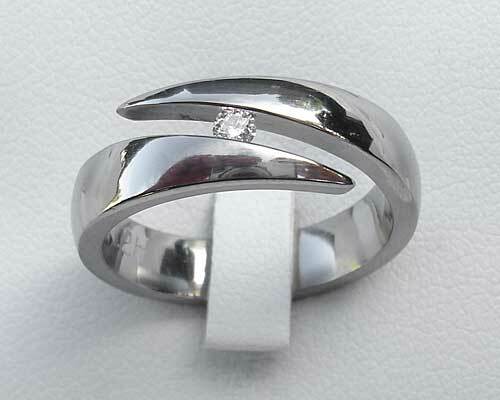 Pictured also is the matching plain wedding ring. Precious stone(s) Available: 1 x 5pt white diamond or 1 x 10pt white diamond.